Monk Account and Pagoda Fund Account is one of our deposit services which allowed monk, pagoda or the Buddhist association to open a deposit account for management of cash or pagoda fund etc. Keeping cash or fund of a pagoda or monk in the safe place and conveniently and it can be made withdrawal as needed at any time. 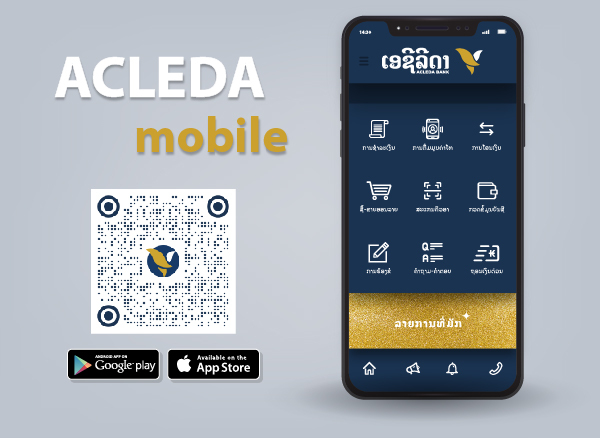 Management of cash flows with transparency and safety at ACLEDA Bank Lao Ltd. and paying in cash with other parties. Receiving funds that can be transferred into an account via ACLEDA Bank from disciples of Buddhist and the general public. Building the confidence and liberality from disciples of the Buddhist. Monk Account and Pagoda Fund Account is a kind of Current Account, Savings Account or Fixed Deposit Account, according to the requirement. Currency is available in Lao Kip, US Dollar or Thai Baht. Monk identification document with photo. Mobile phone number and/or e-mail. Monk identification document with photo and a passport which is valid for at least 3 months from the received date. Residential document certified by local authority or an abbot. Lao: Each account member have to provide documents like the above point 1 and/or an identification document of the account member as the laity. Foreigner: Each account member have to provide documents like the above point 2 and/or a passport of an account member as the laity. Foreigner: Each account member have to provide documents like the above point 2 and/or a passport of the account member as the laity, and does not required any document from an abbot or local authority. Identification documents of account members such as a monk identification document and/or Lao identification card or passport of pagoda commission members or the management team of the Buddhist association. Decision letter on the appointment of an abbot or head of the Buddhist association. Management structure which is comprised of the pagoda commission members or the management team of the Buddhist association. Article of the Buddhist association or pagoda. Permission or decision letter from the Ministry of Cult and Religion such as a letter of pagoda processing, a letter of naming pagoda, or a certificate of association etc. Decision letter on account opening of the abbot or head of the pagoda commission or the Buddhist association. Proxy letter of pagoda representative or the Buddhist association or other relevant documents. All the above documents required to provide in Lao or English or translated into English or Lao officially.